The 2017 U.S. Census Bureau estimates that there are roughly 1.4 million Native Hawaiians/Pacific Islanders (NHPIs) alone or in combination with one of more races who reside within the United States. The NHPI population was also one of the fastest growing race groups between 2000 and 2010. NHPIs have cultural and historical challenges related to chronic disease management, especially diabetes and hypertension control. According to the latest Health Resources and Services Administration’s 2017 Uniform Data System (UDS), the Native Hawaiian (NH) and other Pacific Islander (PI) populations at heath centers had overall lower rates of both controlled hyper­tensive patients (BP < 140/90) and controlled diabetic patients (HbA1c less than 8) compared to the White and Asian Ameri­can populations. In light of these findings, there is continued need to identify social, cultural, and economic determinants of health-related interventions that are critical to address diabetes and hypertension for NHPI populations at health centers. Interventions may include innovative community partnership models and health care interventions that are successful in addressing social determinants of health contributing to chronic disease in NHPI communities. AAPCHO’s data analysis and recommendations will serve as a resource to health centers on the current status and prevalence of chronic disease amongst NHPIs in health centers throughout the continental U.S., Hawaii, and the Pacific region. The report will also take a deeper dive into Pacific Islander (PI) health issues considering that the UDS reports do not disaggregate race/ethnicity data. The report will highlight promising practices to reduce the incidence of A1c>9%, including the Pacific Islander Diabetes Prevention Program—a CDC-recognized national program addressing prediabetes. To report on the 2017 Uniform Data System (UDS) analysis highlighting the impact of chronic disease outcomes for Native Hawaiian and Pacific Islander populations within health centers. 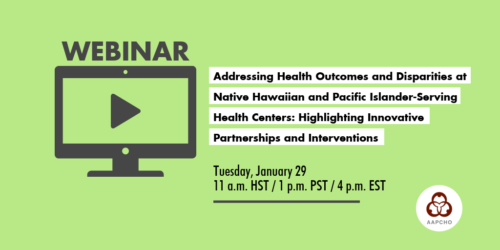 To explore key differences between Native Hawaiian- and Pacific Islander-serving health centers to other health centers across the continental U.S., Hawaii, and the Pacific region. To discuss the implications of key findings and opportunities to use the data for developing clinical and non-clinical interventions through innovative community partnership model. Health center staff from clinical and non-clinical perspectives and from all levels of leadership. Primary Care Associations (PCA), Health Center Controlled Networks (HCCN), academic institutions, funders, government agencies, and community-based organizations (CBOs) working to support health centers that serve Native Hawaiian and Pacific Islander populations.